Good news for folk with a Gear S2 or Gear S3. 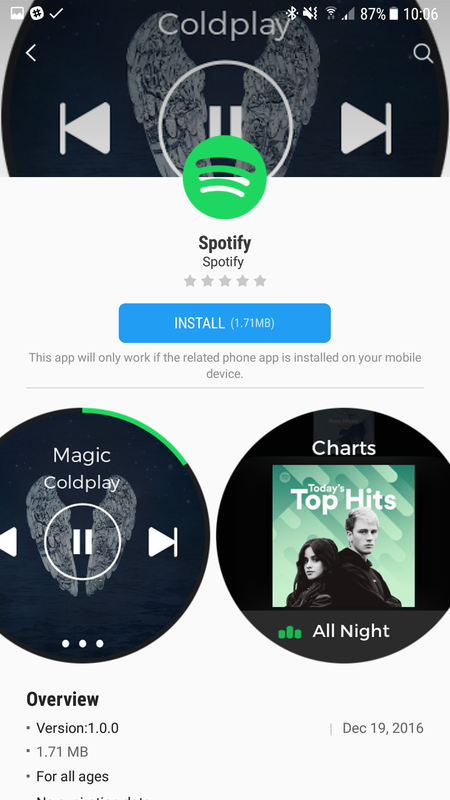 Starting today, you can finally download the much-anticipated Spotify client for the wearable from the Galaxy Apps Store. As expected, the application allows users to control music playing on their paired smartphone using their watch. To install Spotify on your watch, open up the Gear Manager application on your smartphone, navigate into the Galaxy Apps Store, then search for Spotify. If no results are generated, don’t panic. It merely means that the app hasn’t reached your location yet, but it should do by the end of the week. Is not working on my gear s2. It says that there’s no bluetto connection even though the gear s2 is well pared. Works great. Not a big Spotify user but just downloaded it, and works very well, could play music while connected to Bluetooth speakers, all controlled from the S3. Great!! Oh hope it also applies to the Gear Fit 2, believe only the USA got this function even though it was shown in global promos !!! Awesome about bloody time, been waiting ages for this, offline mode … not bothered would be nice though, with my Level U headphones nice phone free combo. But again lack of integration thought, i find swiping down to access the music player as opposed to having another shortcut screen, but it is default the stock player, not an issue as gives the basic functions. How about Spotify for Gear Fit2 in Europe, still nothing in the store. The only way to download it is with the VPN through the US store.